Get your Die cut Business Cards in 5-10 days. Looking for truly customised cards? 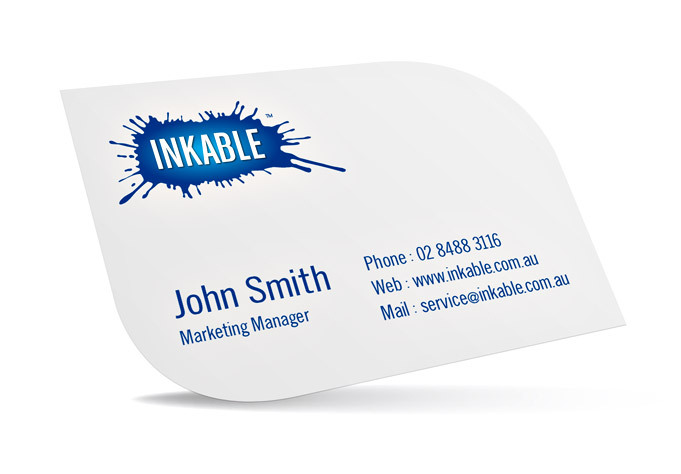 The possibilities are endless with Inkable’s fancy and decorative Die cut Business Cards! Ranging from simple shapes and geometric designs (i.e. 4 rounded corners, 2 rounded corners, slanted cards) to bespoke punched out contours (e.g. vector shapes of cars, flowers, cartoon characters, houses), you are sure to deliver unique cards that will showcase your character and leave a lasting impression. Apart from being effective touchpoints that are handy in meetings and networking events, these dynamic cards will afford you that distinguished look to make you stand out from competition. We offer quality DIE CUT BUSINESS CARDS at truly competitive prices. We have many stocks not listed. If you have something in mind please contact us. CUSTOM DIE CUTS: These are not available through our online system. For specific cutouts, perforations, hole punching, and unusual sizes, please use our Custom Order Form. Die cut Business Cards gets you one step ahead because they are visually interesting and can be distinguished just by feeling its edges. Custom die cut cards creative, original, and are full of character—there are a lot of finishing options that can make them, even more fun and festive if it suits your particular brand. Die cuts immediately transform your cards into a very bespoke, high-end marketing tool that is an unforgettable touchpoint to enhance your brand personality to customers. Be aware that cards larger than 90mm x 54mm will not fit in standard card holders or binders. Be sure that die cut edges are not too sharp as they may cause paper cuts. While unique fonts are great, don’t give your customers a hard time. Pick something that is legible so your contact details can easily be read. Make sure the die cut shape and design of your card follows the theme and style of your branded marketing materials as closely as possible. If these are promotional cards, remember to highlight your main message with a simple shape that will draw the eye to the text. Don’t be afraid to innovate! Custom die cut business cards can be injected with even more personality. Opt for additional functional and eye-catching enhancements like perforations for a “pop up” business card, hole punching for cards that can be strung together or where pens can be inserted in, fitted slits with scored panels to make your cards stand, or add Spot UV to make parts of your design more dramatic. With commercial printed business cards, a colour shift of 10% is very common. This will be most apparent on business cards with solid color backgrounds. This includes the use of your official CMYK logo and brand fonts. Printing can sometimes make colours darker or lighter, so speak to your designer about this. Print your business card with a 1:1 scale on an inkjet printer before sending your artwork to Inkable. Include a die cut business card in your sample kit so that prospective can carry it in their wallets and, depending on how creative your design is, this could have the potential to become an interesting conversation starter. Use a clean vector proof of your card’s artwork and add it as an attachment to emails. If your cards turn out to be better than expected, upload your prints on content curation sites as they could even get you fans simply due to the interest it will fetch on social media.